• Influence of the builder country on international ship prices, by Floriano Carlos Martins Pires Jr., William M. Cipriano, Luiz Felipe Assis [paper in Portuguese]. • A steady state analysis for yard performances, by Marin Marinov, Philip Mortimer, Tom Zunder, Dewan M. Z. Islam, [paper in English]. 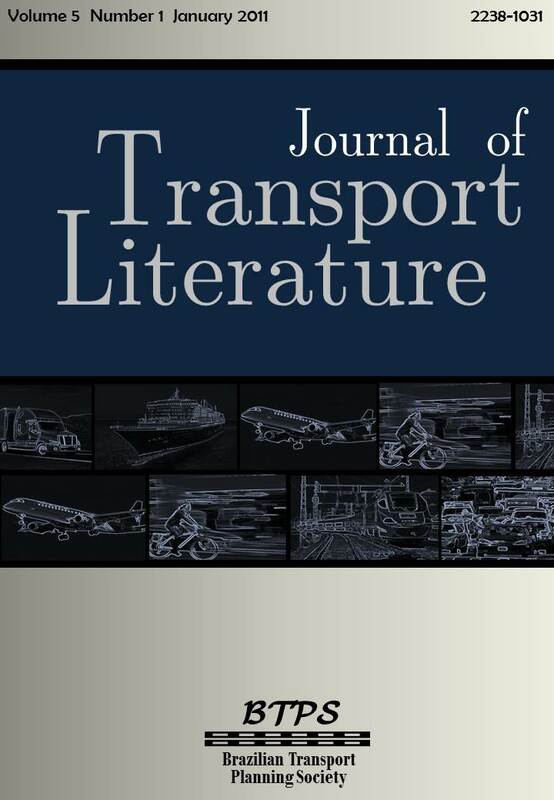 • Costs of freight transportation in Brazil: highway versus rail, by Rogéria de Arantes Gomes Eller, Wilson Cabral de Sousa Junior, Marcos Lopes Cançado Curi [paper in Portuguese]. • Water transportation of regional fruits from local productive arrangements in cities of the metropolitan region of Manaus, by Andressa Oliveira Marques, Nelson Kuwahara, João Bosco Ladislau de Andrade [paper in Portuguese]. • Aircraft insurance price and its determinants, by Cícero Rodrigues de Melo Filho [paper in Portuguese]. • Air regional sector at São Paulo state: the role of state in the air transport planning and management, by Ana Paula Camilo Pereira, Márcio Rogério Silveira [paper in Portuguese]. • Airport infrastructure as regional air traffic developer in Brazil, by Marcos Alexandre Rauer Demant [paper in Portuguese]. • Study and airport demand forecast to the city of Rio de Janeiro, by Mayara Condé [paper in Portuguese]. • Analysis of the supply determinants of tourism sector: effects on air transportion sector, by Edgard Antonio Pereira, Emerson Fernandes Marçal [paper in Portuguese]. • Study of the effect of distance between bus stops in vehicle cycle time variables, by Denis Hideki Kishi Konishi, Melissa Sabrina Mendes, Luiz Antonio Tozi [paper in Portuguese]. • Diagnosis of the Brazilian airport system and the alternatives for its privatization, by Dorieldo Luiz dos Prazeres, Leonardo Lúcio Esteves, Rogério Pecci Filho [paper in English]. 2016 | ITPS | International Transport Planning Society. Powered by Blogger.